“The Carnival Vista is a completely new class of vessel. You might see some areas that look similar to other ships but technically-speaking, structurally-speaking, the Carnival Vista is unique in the Carnival fleet ” Chief Engineer Cesare Boldini asserts with evident pride. To begin, Carnival Vista has a new azipod propulsion system. Two 170 ton pods hang beneath Vista's stern, each with a propeller mounted on it. Inside the pods are electric motors, which are powered by diesel generators (diesel engines located within the ship's hull. The pods can turn 360 degrees and so the pods perform the functions not only traditionally performed by a ship's propeller shafts but also the functions of the rudder and the stern thrusters. Carnival has built ships with azipod propulsion before. Indeed, when she entered service in 1998, Carnival Elation was the first large cruise ship to be equipped with azipods. However, for the Conquest and Dream classes, Carnival went with a traditional propulsion system. 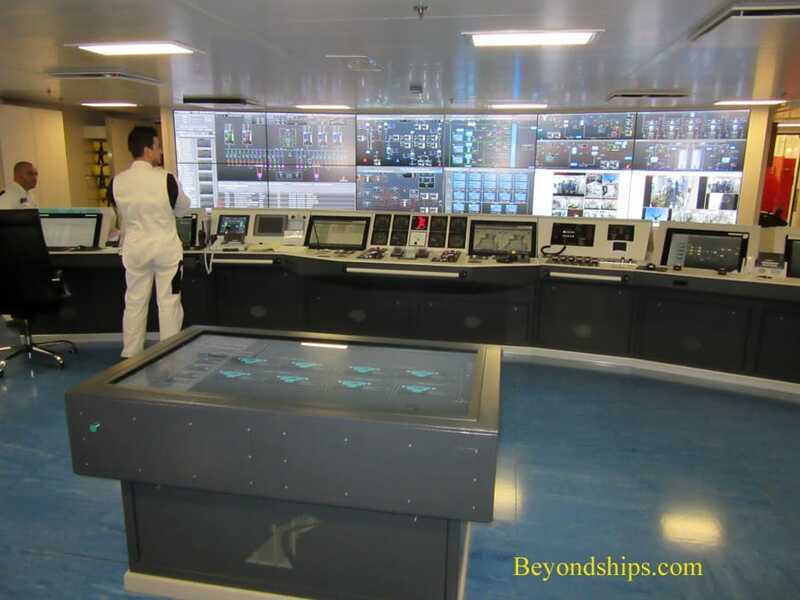 Vista is also different from other Carnival ships in how her systems are configured. Under the International Maritime Organizations' Safe Return to Port regulations cruise ships built after 2010 have to be capable of withstanding catastrophes such as a major fire and still be able to reach port while continuing to provide certain services to the guests. Such efforts led Lloyd's Registry to award Vista the ECO Class Notation (Environmental, Construction and Operations beyond statutory requirements) certification.